Heath made it three wins on the bounce and moved up to sixth place in Yorkshire One with a 22-10 home win over North Ribblesdale. 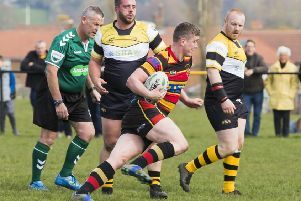 The North Dean men were without injured pair Si Brown and Mark Puttick but Cameron Ramsden and Dom Walsh returned against opponents with one point fewer in the table. After an even first 10 minutes a deliberate knock-on by Heath led to a successful Ribblesdale penalty but the hosts responded through Jack Crabtree, Callum Harriott-Brown and a superb 50 metres run by Josh White, who released Ezra Hinchliffe. Ribb were offside and although Hinchliffe was off target, he made it 3-3 with a second attempt on 19 minutes after he had featured in an attack along with Daz Neilly, Alex McFadden and Matt Baxendale. Heath soaked up five minutes of pressure in their own 22 before a massive punt from Hinchliffe took play to half way. Neilly broke with Fergus Marsden in support but a try-scoring opportunity was lost when the pass went astray. However, a high tackle resulted in a lineout 10 metres from Ribb’s line and quick passing enabled Ramsden to go under the posts and Hinchliffe converted for 10–3. Heath were now playing well but a 38th minute penalty went just wide. Dave Harrison’s side maintained the momentum after the break and Baxendale was unlucky pursuing a kick. Crabtree, Pollard and Baxendale went on the charge and Heath’s second try came on 48 minutes when Marsden won lineout ball and from the maul Walsh got Birkett away, culminating in Ramsden crossing again. Hinchliffe converted for a 17-3 lead. The visitors re-grouped and attacked. When Chris Piper was sin-binned and Matt Beasty was injured, Ribb were suddenly on top and they controlled the ball well from a scrum for their No 8 to score a converted try on 61 minutes. However, Ribb dropped the ball from the re-start and Pollard swooped for a try. The conversion attempt was just short. A great run from Harriott-Brown set up Heath’s next attack but the last 10 minutes was scrappy and Ribb pressed for another try but Peter Birkett led a strong defensive effort.